The life of James Birdseye McPherson was cut short by a Confederate rifleman. Thus ended the career of one of the most brilliant young generals in the Union forces. General McPherson�s death was referred to by his military peers as �one of the heaviest individual losses ever suffered by the Union forces.� ■ McPherson�s forebears were Scottish Highlanders who emigrated to the American colonies in the 18th century. He was born at Sandusky, Ohio, on November 14, 1828, the son of William and Cynthia Russell McPherson. He attended the U.S. Military Academy at West Point where he was graduated first in his class. At the outbreak of the Civil War, he was a captain in the Corps of Engineers. McPherson moved rapidly through the ranks and was soon chief engineer on the staff of General Ulysses S. Grant. Grant cited him for �conspicuous skill and personal bravery� in the siege of Vicksburg and had him promoted to brigadier general. 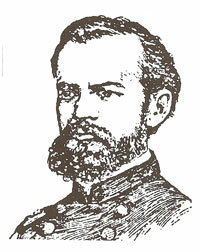 ■ After Vicksburg, McPherson was put in command of the Army of the Tennessee and concentrated his attention under General Sherman in the siege of Atlanta. Rallying his forces in the face of a strong counterattack by Confederate General John Hood, General McPherson was shot and killed by a Confederate patrol. ■ General Grant was highly complimentary. He referred to McPherson�s �Courage, patriotism, perception, and genius, and his great, almost unparalleled ability.� Grant put McPherson on the same level of competence as General Sherman. �They are,� he said, �the men to whom, above all others, I feel indebted.� ■ General McPherson was liked by the men he commanded. In tribute, the men of the Army of the Tennessee erected a statue that stands in a park in Washington, D.C.